Virgin America has announced a contest in partnership with the San Francisco Giants and Stand Up To Cancer this summer, where the winners will have their face included in a mosaic decal on the side of one of their Airbus A320s. 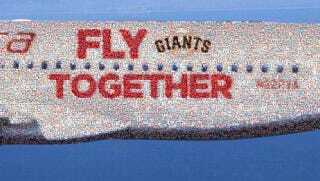 Giants fans who share a photo of themselves being a Giants fan on Facebook, using the #FlyTogether hashtag can win a spot for their mugshot on Virgin America's Giants-branded "Fly Bye Baby" plane. To me, the best part about this is the $5 donation Virgin America is making to Stand Up To Cancer for each photo submitted, up to $25,000, toward airline tickets for cancer patients. The fan whose photo gains the most likes on Facebook can also win a pair of tickets on Virgin America. Once the plane is in service with the decal, people who tweet a photo of the plane with the #FlyTogether tag also have a chance to win Virgin America tickets. The contest ends June 29th. The Giants are 3 games up on the Dodgers as I write this, but clearly this is a situation where everybody wins.